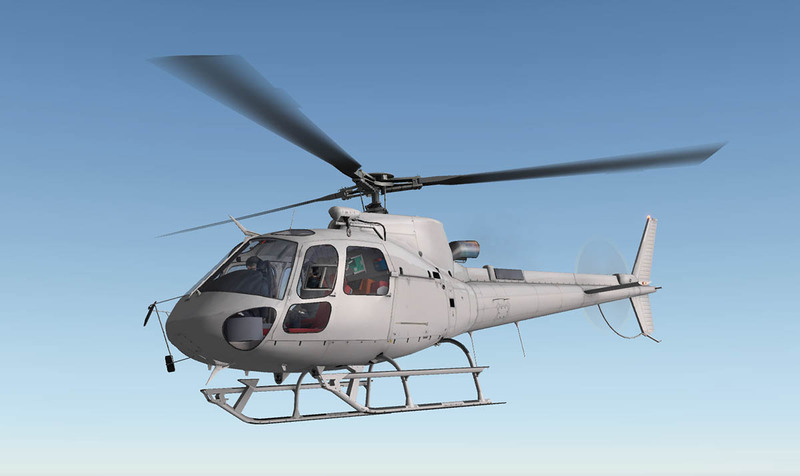 The Eurocopter AS350 B3 (Plus) Ecureuil (Squirrel) is a single-engined light-utility helicopter that was originally built by Aérospatiale but is now part of Eurocopter Group (Which will soon be again rebranded as Airbus Helicopters). 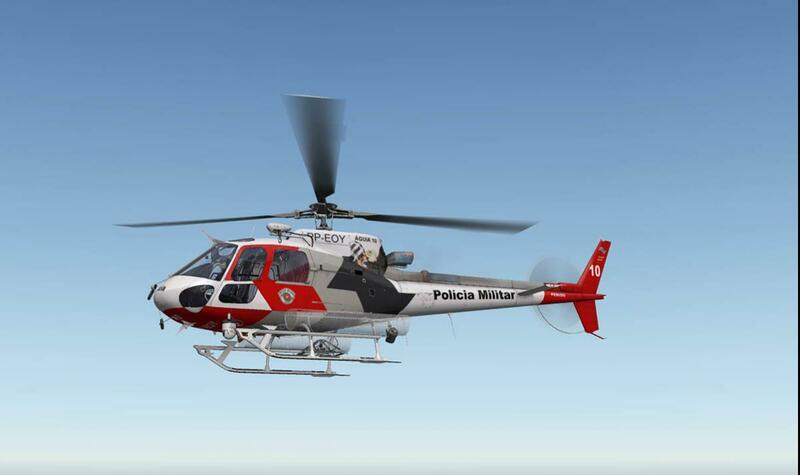 This version is the High-performance version, is powered by an TURBOMECA-Arriel 2B1 engine equipped with a single channel (DECU) Digital Engine Control Unit with a mechanical backup system. 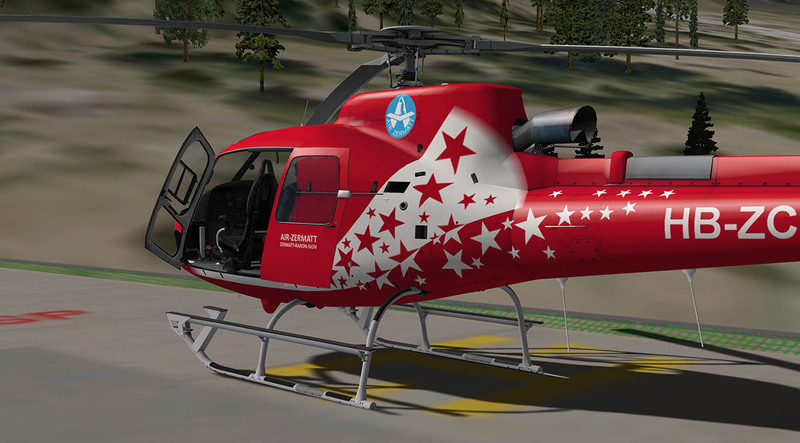 The AS350 B3+ from Nemeth Design and DreamFoil Creations is an FSX (Nemeth Design) Helicopter that has been transfered into X-Plane10 (DreamFoil Creations). 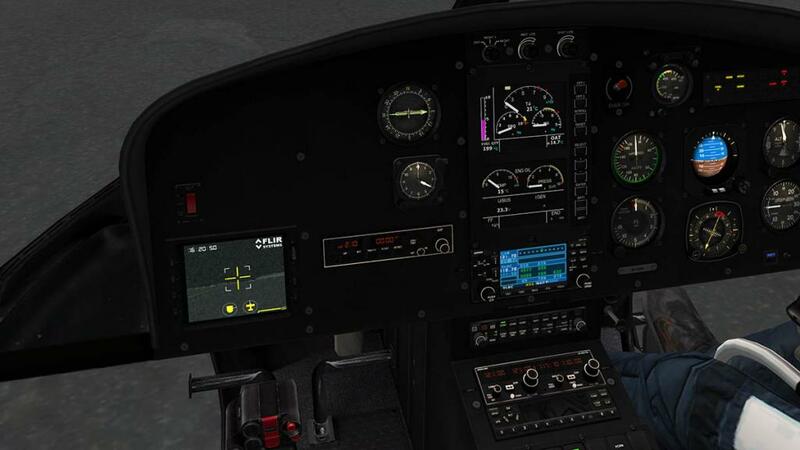 Some of the best and most successful aircraft that have come into X-Plane over the last few years have been crossover products that were created for FSX/P3D platform and are usually totally overhauled for the X-Plane10 platform. And here the AS350 B3+ is certainly the best blend of both platforms using FSX strengths are usually in the excellent 3d modeling and textures, and X-Plane's better flight dynamics and HDR features. 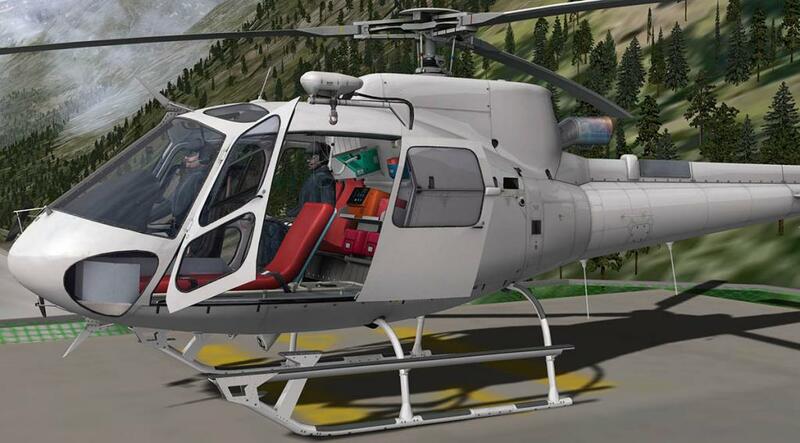 It is best first however to explain how the AS350B3+ Helicopter is configured to understand what you are looking at. 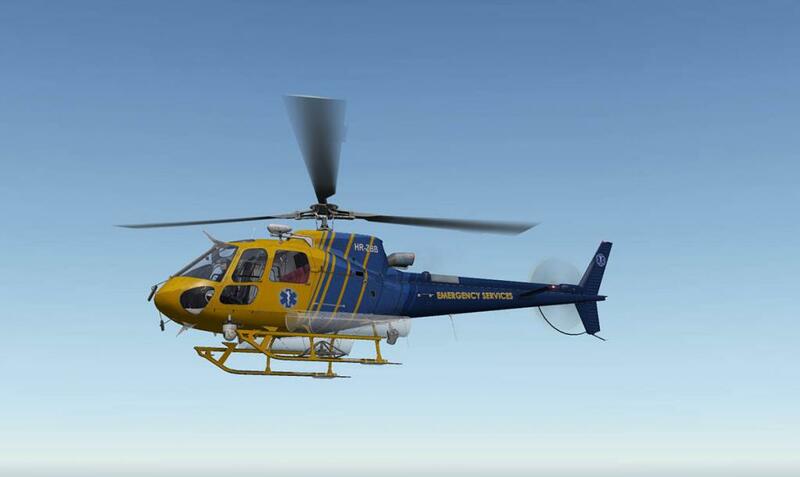 Both Medical and Police versions are the "complete" setup of each aircraft for its genre. This is setout in a "Equip.cfg" file that can be edited in a text editor. Complete Medical version you have: Medical, Wirecutters, Mirrors. Complete Police version you have: Searchlight, Hoist, Wirecutters, Mirrors, LatTow, FLIR, Left/right Basket. 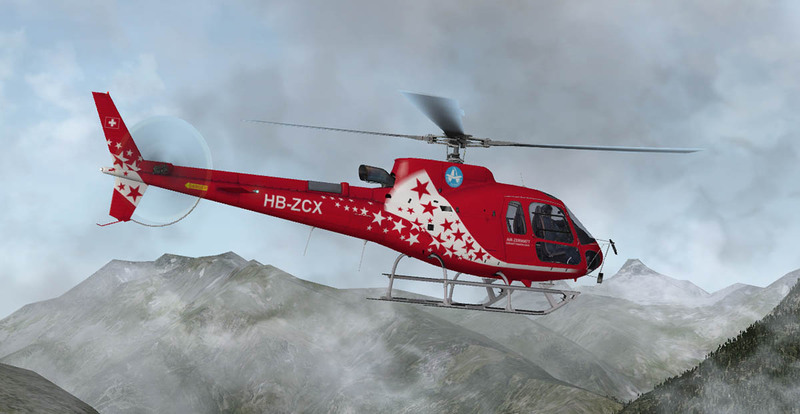 The great thing about this Equip.cfg system is that you can change and set up the aircraft with just the equipment you want to use, and if creating a specific livery it also allows you to set out the equipment that is associated with that livery. 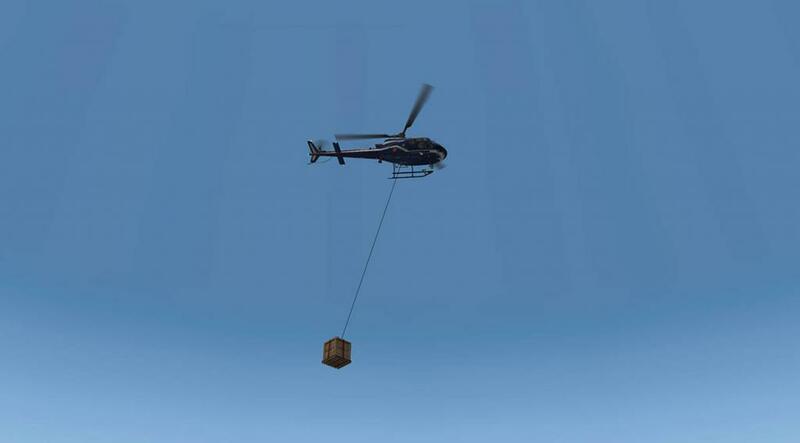 A great feature is that you can carry a box under the helicopter swinging from the underside winch, just don't attach it up to to high winch... because it will pull the AS350 B3+ straight over? There is also a "smartmenu" that is accessed on the right-top of the glareshield of the instrument panel. 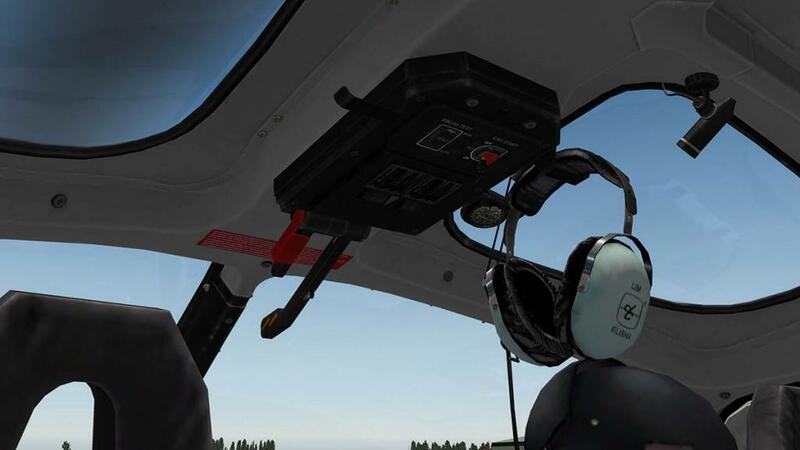 This menu access makes the AS350B3+ highly equiped and detailed, walking around the aircraft in its different versions the quality and the detail is excellent. 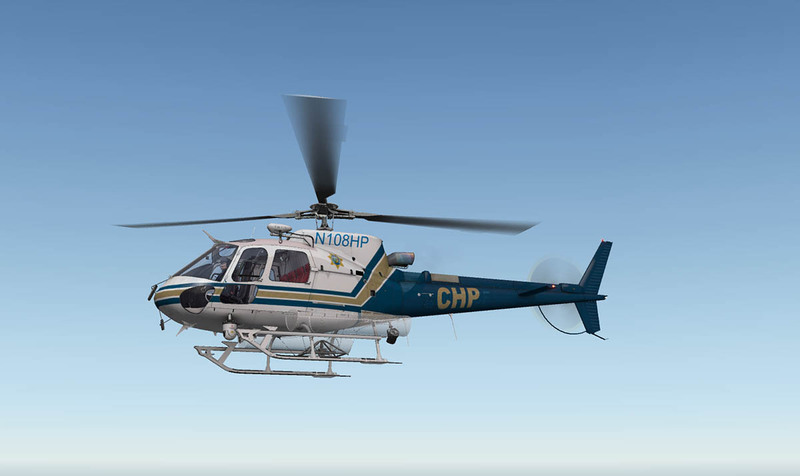 On the AS350B3+ the linkage 3d work is exceptional and intricate and all the movement animations are perfectly realistic, the main and tail rotor blades are also carbon copies of the original items. The Eurocopters fuselage and tail boom have also been very well crafted with excellent detail, The burnt crafted exhaust gives out a slight black smoke with HDR off and a heat blur with HDR on. 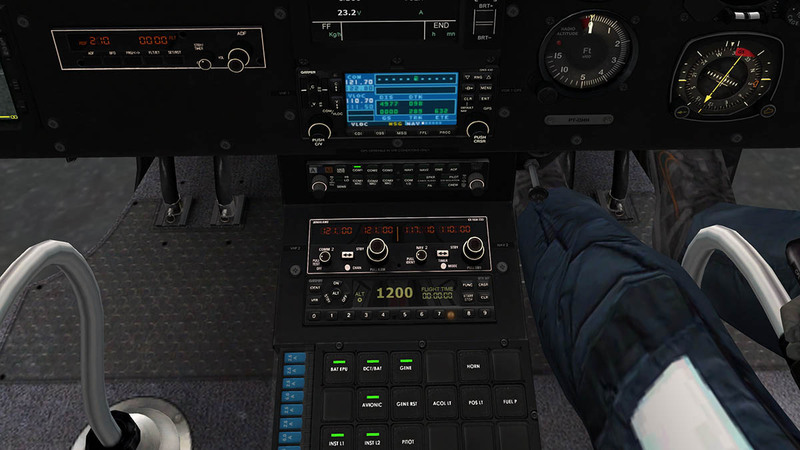 It is very easy to set up the aircraft for a specific mission. Just selecting the Medical option will give you a full medical layout and you can select if you want a badly injured patient or not on the side stretcher by the (small) pop-up menu screen. 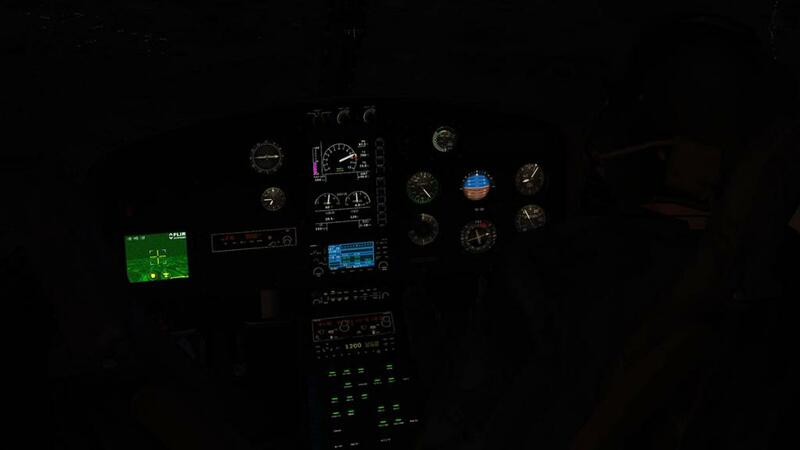 (note: it cannot be adjusted outside the aircraft, you have to go into the 3d cockpit mode before selecting the patient). 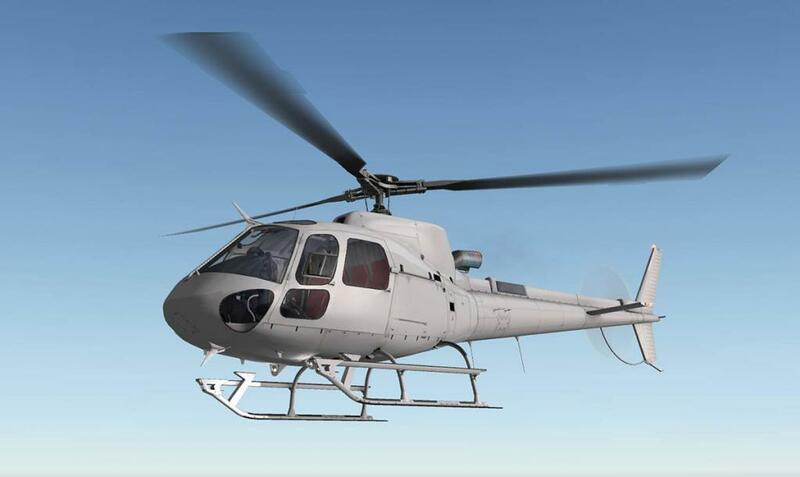 The AS350B3+ is a single pilot helicopter, and so the instrument panel is quite basic in its layout and functions. If the FLIR attachment is operational then on the left side of the panel you get a Infrared screen that works in the day or night, it is highly adjustable as well in movement including zoom. Cyclic is beautifully made and adjustable for friction at its base. 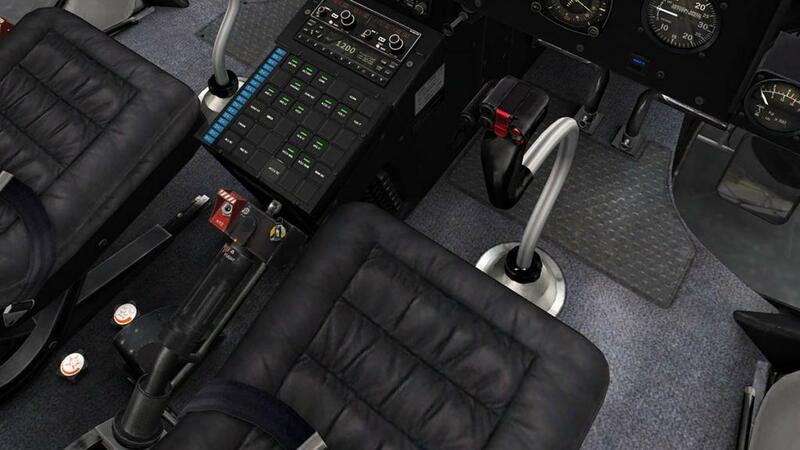 The Collective is functional as well with a lock - hydraulic isolation and Search-light (toggle) switch, all other cockpit items including the rudder pedals are worn and realistic. 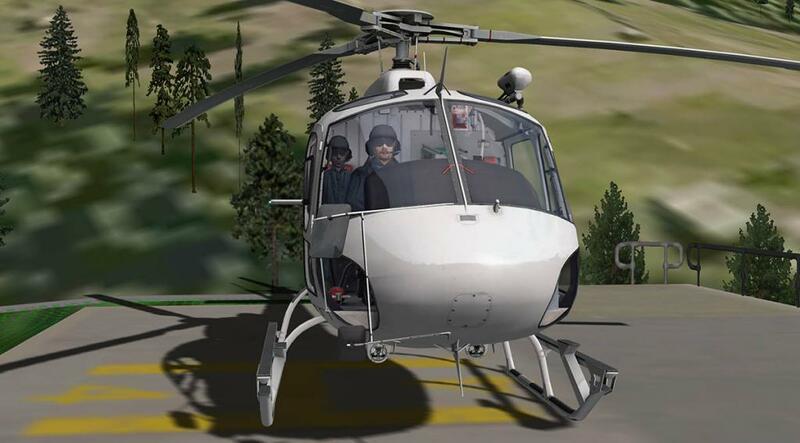 Overhead is a light, the rotor-brake and the fuel valve switches (on/off) and an optional headset. 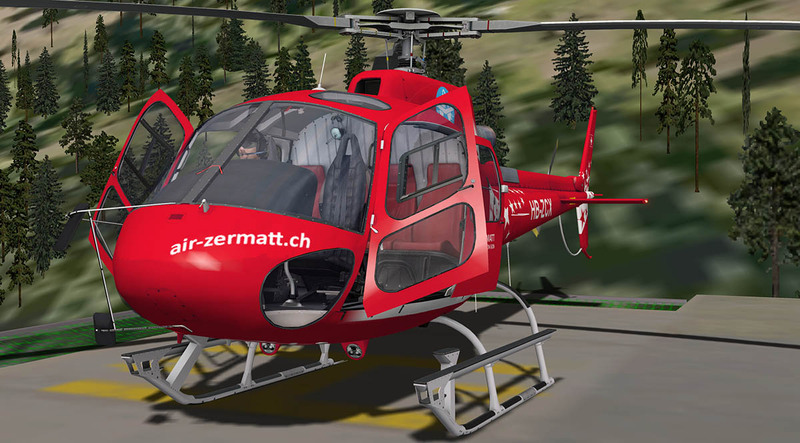 (a note is that you need to flick the grey switch on the rotor-brake to start the engine). Panel night lighting is selected by buttons on the SCU panel and you can adjust the brightness on the main panel. 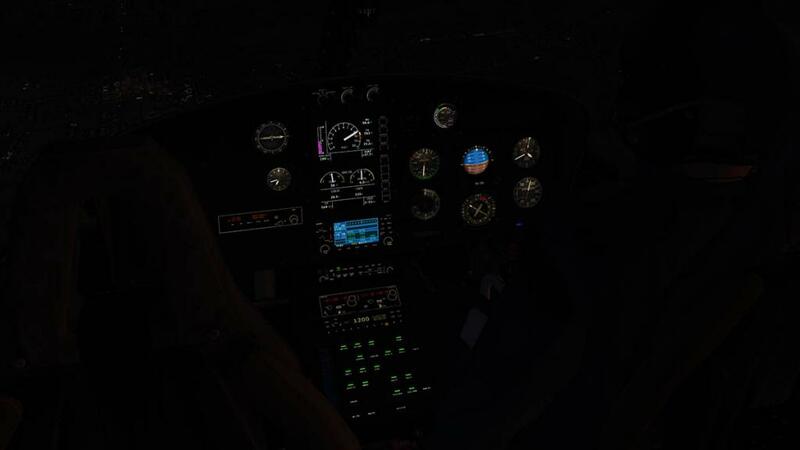 If FLIR is attached the the night-screen glows green in the cockpit and which is highly effective. 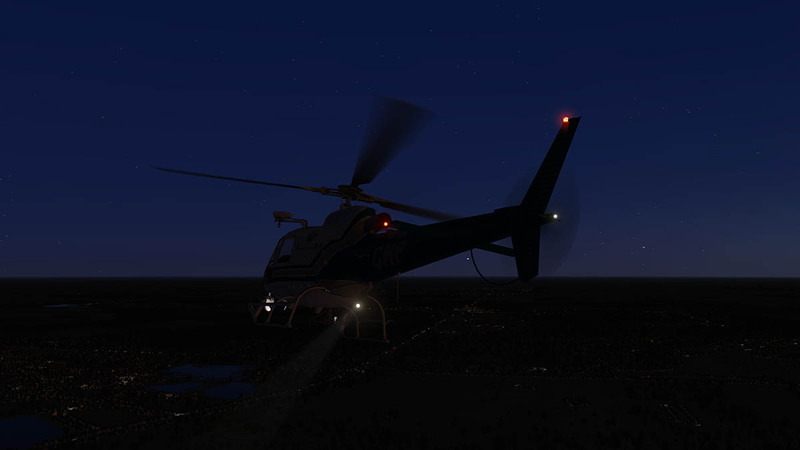 Outside lighting consists of two underside lights (one taxi - one landing) and the usual, beacon, strobe and navigation lights... a major feature is the spot-light that is positioned just under the rear of the main cabin. You can select specific controls (In the "buttons Basic" menu) to turn the spotlight on/off (also on the collective) and set up a hat switch to rotate it around and up and down, with the HDR on it is highly effective. Sounds on the AS350 are excellent as Dreamfoil created the DreamEngine sound engine, so you expect the sounds on this Eurocopter to be good, and here it does not disappoint. You get 3D positional sound, 3D coning,here yo have layered sounds with the doppler effect and the DreamEngine can hold up 128 different sound sources. ... So simply put is that Arcade Mode will take out all the real aircraft reactions and replace them with more sedate versions. But I found the mode more realistic than that. In fact because it dumbs down the movements you can understand the way helicopters behave a little better. you do still have to fly the machine the same way even with the arcade mode switched off as with it on, but it makes it easier to anticipate the machine's movements in both modes, which means what you learn flying the helicopter in Arcade mode is then very easily translated into normal vertical fight flying, Arcade mode is really like having training wheels for helicopters as it sits between starting to fly and learning of how-to-control the helicopter - but with out the full agony of crash after crash after crash. 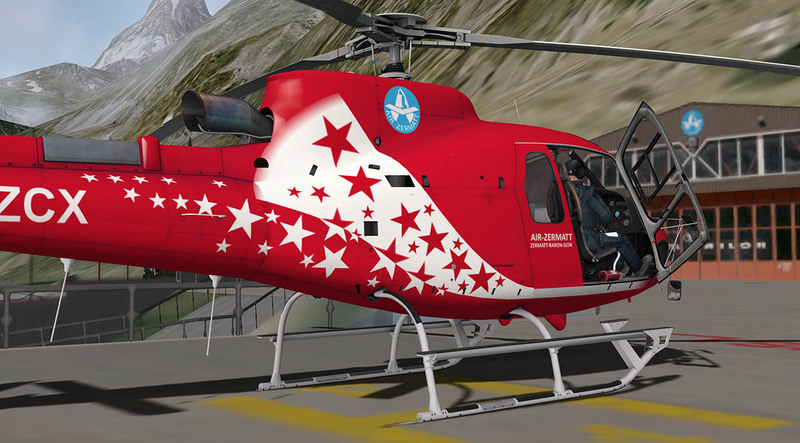 The Eurocopter AS350 B3+ was released in April 2013, and like many new Add-On's, some can take time to understand in depth. This aircraft is so multifaceted that it can take a while before you explore all of its talents and combinations. 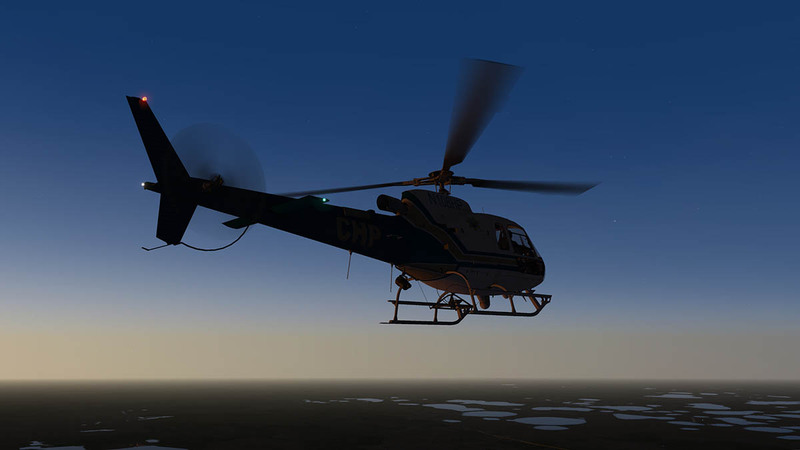 Flying the AS350B3+ is a learning curve as well, in the normal mode it is a tricky beast to learn, but that is the nature of the beast as well. Get it right and the rewards are outstanding and you keep wanting to go back for more. 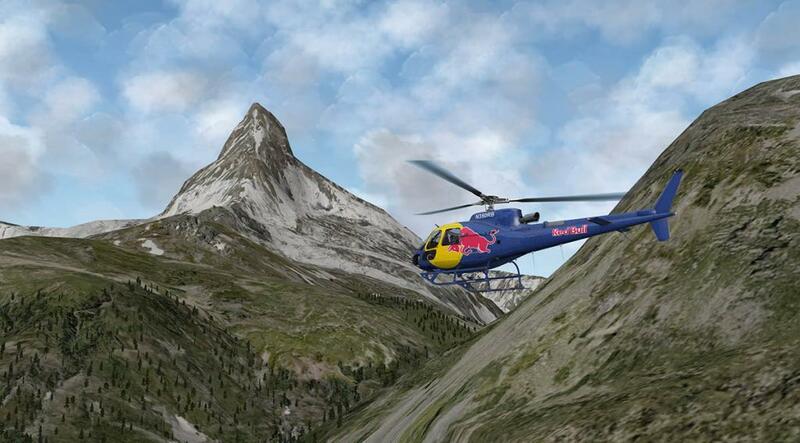 Helicopters are like that, they are highly addictive because they demand skill and precision to fly correctly. And you have to process that information and practise the skills to get to a high level. The creators of the AS350 B3+ have created a very highly tuned machine to fly with skill. But have still given you a get out clause with the Arcade Mode to learn without failing. In that it is possible for anyone to fly this aircraft even if you don't have the time to get perfection. 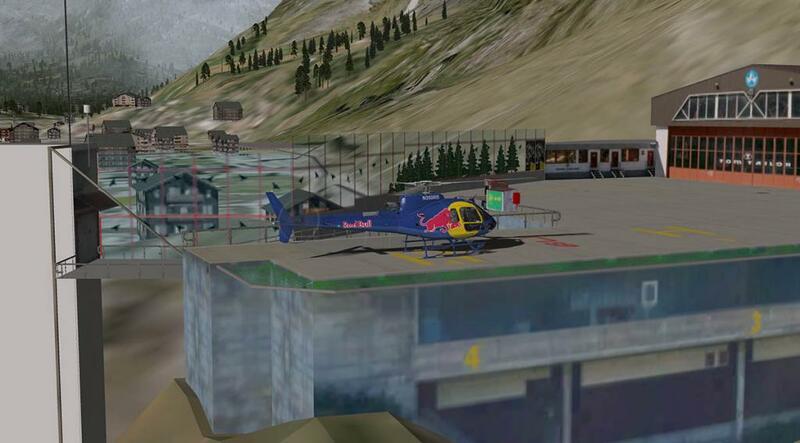 For me, I can fly to Zermatt (Switzerland) and land on a platform that in real life looks impossible to achieve. I can do it in Normal mode, but Arcade Mode can make it possible for anyone to achieve the same results. The aim is not to be lazy and stay in Arcade Mode for life, but to go beyond its training limits and progress to the normal mode. 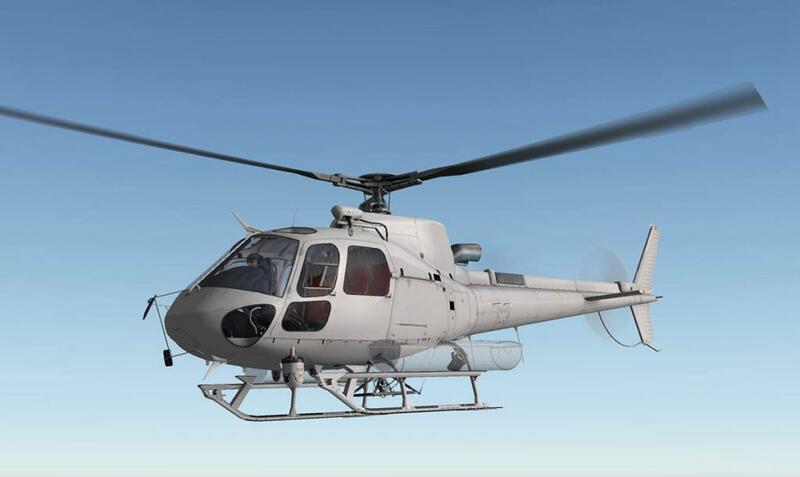 And that sums up the aircraft, It is very highly crafted with incredible textures and modeling, If you want the detail and the perfect recreation of the Squirrel AS350 with a huge feature list, then you won't find a better Helicopter... 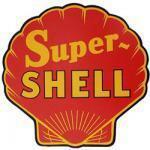 But it is still very assessable to anyone and anyone can fly it.... For value it is outstanding. Documents: There are three manuals with the aircraft. - Fixed memory leak on DreamEngine, used to cause crash after few reloads. - Fixed issue with livery load for null paths, was causing CTD randomly at reload or aircraft change. Any idea when this will be written for X-plane 11.30b4? or even 11.26 stable? I really need this to be VR ready for me to buy this. 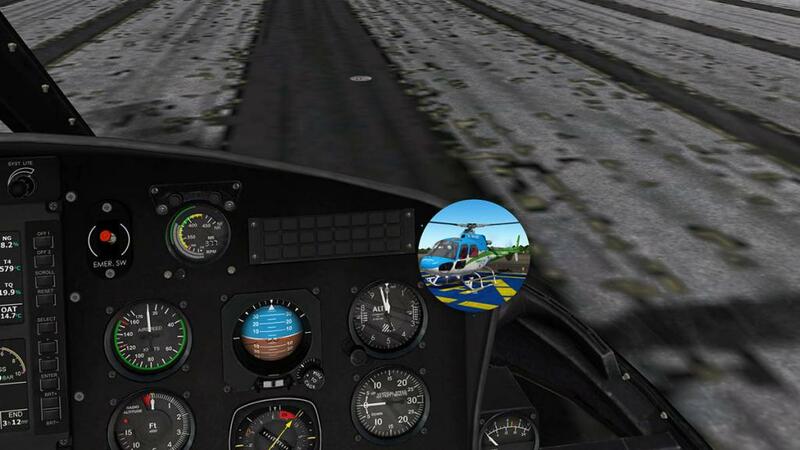 It also needs to be integrated with x-plane 11's different flight modeling techniques to make it 100%. Or am I ready too much into this? There is lot to get through here? the full Beta 11.30 process and then the aircraft upgrade for 11.30 and then the VR refining... it will take some time to sort it all out. 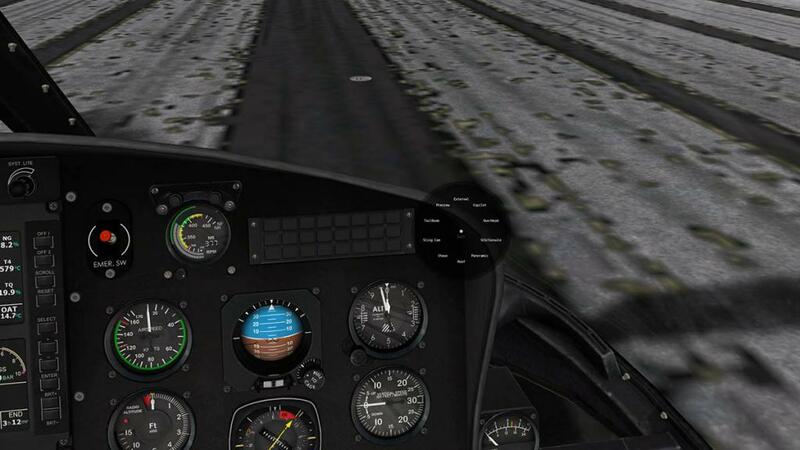 It should be fine in Xp11.26. 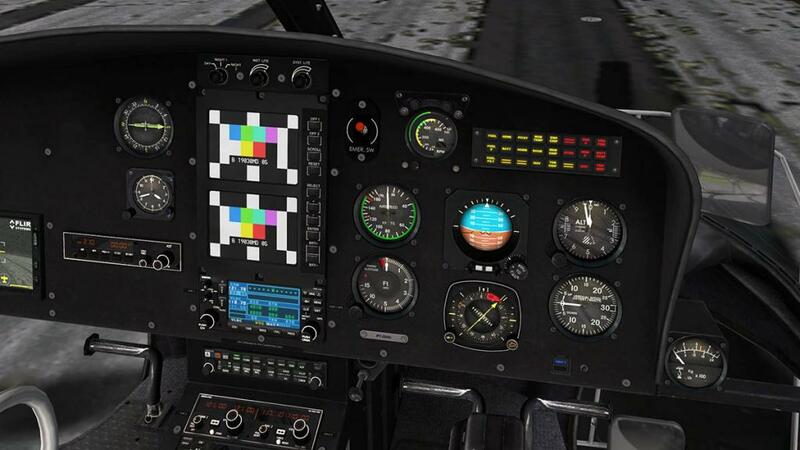 don't fly this in XP11 without updating the .xpl plug-in file first. With the update, this heli has become my favourite, and i am angry no one told me there is an xpl-file to update. 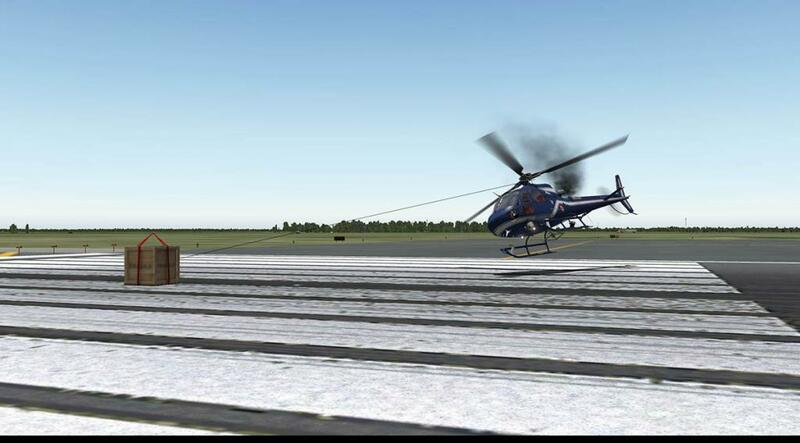 I bought this Eurocopter AS350 B3 Plus, and for some reason it's un-landable on X-Plane 11. The landing seems to be impossible. When decreasing engine power, the copter stays on air and it starts to hover pretty nicely... then suddenly it starts to fall fast and it won't react engine power increasing for like 7 seconds – then it starts climbing rapidly (sounds like bad flying, but in this case it's not my fault). Comparing to any other copter, this seams to be a some kind of a bug? I can easily control any other copter but this is unlandable. It's flyable, hoverable, but it wont land without crashing – not even with the arcade mode on.